I am tired of Trump supporters telling me that Trump is a brilliant business man. He is not. He is a failing business man who routinely files bankruptcy when he can’t make his businesses work, stiffing his creditors and workers. He is a con man who spent his entire career sucking money out of the middle class to enrich himself. Trump University is just one example. Trump knows the game of the rich class, and he is putting on a circus for the middle class to distract us from what is really going on. The ultra rich, and the corporate world, are benefitting from what is going on quietly behind the scenes while we’re all distracted by the dazzling magic show of blunders and corruption and outrageous stagecraft at this rallies. He puts on the Immigrants are Evil public show, knowing fully well that none of his facts make any sense, immigrants have nothing to do with the problems of America, because he knows we can only be angry about one thing at a time. Dismantling National Parks or opening them to exploitation by mining and logging. Removing consumer protections imposed on banks and credit companies. Instituting tax cuts that favor businesses and super wealthy individuals and are largely meaningless to the middle class. Neutering the EPA, whose mission it is to protect the public from corporate pollution. Dismantling the Department of Education and pushing our public funds to private for profit schools where we have no control over the use of the funds. Increasing the military budget and thus feeding the military industrial complex. The increase of $80 billion this year alone is more than the entire military budget of Russia. Removing all our work toward research and protection against climate change. This is the worst crime of all, since it’s going to take decades to fix, and our grandchildren get to clean up the mess. This is a crime against humanity. Watch the hand behind his back, not the circus in front of our faces. We, the middle class, are getting hurt and exploited everywhere along the way. The debt is skyrocketing. Some day we will have to pay for all this, and Trump won’t be around to help with it. Corporate America is doing great and the middle class is not getting the benefits. That’s why the stock market is rising. When it all comes crumbling down, the rich aren’t going to be affected much. They’ll still eat and travel in helicopters. It’s the middle class that will lose everything – once again. Trump will long be gone by then. I have spent more than twenty years of my career helping human services and early education agencies all around the country with administration of childcare programs and everything related to it. My customers are child advocates who have dedicated their lives to breaking the cycle of poverty in our country, and helping young children get out from under the yoke of economic oppression and sometimes misfortune. They are dedicated to the welfare and safe-keeping of young children, and they are passionate about it. Their work means everything to them. I cannot imagine what it must feel like for them to be forced to be complicit with state-organized and state-created child abuse and human trafficking, because that is exactly what I think is going on in our country now. These child advocates are now finding themselves in a position to have to search for care and safety for thousands of children who should be with their parents, but have been kidnapped by our government. This is a crisis entirely of our own making. The United States used to be John Winthrop’s Shining City upon a Hill, and we came after countries for human rights violations. Then it started to get shaky when Bush and Cheney started openly torturing people. McCain, a torture victim himself, spoke out against the practice. Once we tortured our prisoners, every American soldier, upon capture anywhere, would then have to fear to be tortured him or herself. Now, with open racism, and state-enacted kidnapping, child abuse and human trafficking, taking children, even babies, away for their parents with no hope of reunification, we have lost all moral authority for decades to come. It will be a very long time before the United States can lecture a rogue dictator for human rights violations. It will be a very long time before we can justify invading a country because it abuses its own citizens. We have given up this bargaining chip. It will be generations before our representatives, our presidents, can walk into a room again and command moral authority, and stand on the principle that the United States does the right thing. I am disgusted with my government that commits crimes against humanity. I am disappointed with my fellow citizens who support these practices by propping up the Little Man in the White House. Right now, I am ashamed for my country! The tweet by Trump above is an abomination. Democrats don’t want illegal immigrants. Nobody wants illegal immigrants. Over the last 20 years, every Congress under every president tried to enact immigration reform, and none of them succeeded, due to political differences. This is not a “Democrat” problem. Democrats, as everyone else, care about crime. Democrats do not want more illegal immigrants because they are potential voters. This is utter drivel. Insane, inane and atrocious nonsense coming out of the mouth of the president of the United States is an insult to every law-abiding, decent American. Likening illegal immigrants to vermin (since only vermin “infests” something) is a racist insult to all human beings. Vilifying immigrants as the “problem” in our country is pure propaganda. Trump and his ilk have created a divisive issue and problem where one doesn’t exist. Our country has a lot of problems, and illegal immigration is one of its problems, but it’s by far not its biggest problem. The idiotic border wall makes no sense. Separating children from parents makes no sense. Neither solves the immigration problem. Proper legislation and proper enforcement of that legislation solves the problem. But the Trump administration is making it sound like this is the big problem of our time. They talk like Democrats want open borders. Nobody wants open borders. But saying it often enough and loud enough makes it sound like it is true and real. The whole argument is ridiculous, and it is meant to desensitize us. I can’t help it now, I have to invoke Godwin’s Law again. During the night of November 9, 1938, Hitler’s thugs, all over the country, raided Jewish businesses by breaking their windows and looting their stores. The night was called Kristallnacht, the night of broken glass, due to the shards of broken glass that lined the streets the next morning. They then blamed the opposition. Jews were soon and openly treated as vermin who infested the German society. They used the same word that our United States president used in his tweet this morning: Infest. Once a significant percentage of the population is supporting brutal policies simply by being quiet when they are carried out, the enactors and enablers become bolder and more brazen. Today we are tearing babies away from their parents without any plan of reuniting them later. How is a deported mother ever going to find her infant child again, weeks or months after separation? Today we’re putting babies in cages. Tomorrow we’re letting them die. After all, they are the offspring of vermin, right? And all this is being done in front of the watchful eye of the American public, and we’re letting it happen, and the Republicans in Congress are letting it happen. I am starting to think of Republicans as repugnant. To me, it looks like we have organized crime running the White House, enriching themselves at the expense of the country, systematically de-sensitizing us to brutality, first against the vermin crossing our borders, later against “Democrats” who “want open borders,” and then, in the end, they’ll come after people like me who do not agree with those tactics and politics, who speak their minds in public. As you can see in Trump’s tweet, he has been coming after the immigrants ever since he started his campaign. And he has got a significant portion of our population convinced that immigration is our problem. He has emboldened white supremacists. He is now gradually setting up to come after Democrats, whatever that is. He is actually blaming the family separation activity on Democrats, and his supporters are eating it up. Watch it, soon we’ll start seeing atrocities committed against Democrats. And then, they’ll come after the media and free speech. It has worked before, all over the world. I don’t understand what makes people do things like this to other human beings. I don’t like child molesters. I don’t like child cruelty. I don’t like things like this being done by my government in my name. My work is serving human services agencies that administer childcare and early education programs. So I get into contact a lot with educators and activists on behalf of children. In those circles, it is common knowledge that 80% of the brain development occurs during the first five years of life. When you know that, it is tragic to see how many children are left in a state of stupor staring at the compelling distractions on a television screen, bombarded with cheap programs and highly targeted commercial messages. Small children need to be held, cuddled, tickled, read to, and played with. Children need to be stimulated, they need to be taught. What happens when a small child is completely neglected? Missing the window of the first five years has a devastating effect on the entire life. Here is the story of a feral child that was found in utter neglect at age 7, and a view of her now at age 19. North Korea has a population of 25,337,000 million people. Of those, 25,336,999 are hardworking, malnourished, completely impoverished and constantly living if fear. Many are political prisoners. One is a dictator. When the president of the United States says that he thinks we should completely destroy North Korea, what does he mean? Kill 25,336,999 innocent people who have suffered from lack and abuse all their lives? Could somebody define what “completely destroy North Korea” means? Suki Kim is a Korean-American writer from New York City. She went undercover as an English teacher in a college-level all-boys-institution in North Korea where the sons of the North Korean elite were educated. She tells the story of how she got into her position and how dangerous it was for her to be there. Through her narrative we get an amazing glimpse into the society of North Korea and its people, its culture and its political system that we can’t get looking in from the outside simply from what the media tell us, or what the occasional tourist reports after visiting. Being in North Korea was profoundly depressing. There was no other way of putting it. The sealed border was not just at the 38th parallel, but everywhere, in each person’s heart, blocking the past and choking off the future. As much as I loved those boys, or because of it, I was becoming convinced that the wall between us was impossible to break down, and not only that, it was permanent. This so saddened me that some frozen dawns, when I woke up to the sound of the boys doing their group exercises, I had to fight not to shut my eyes and go back to sleep. — Kim, Suki. 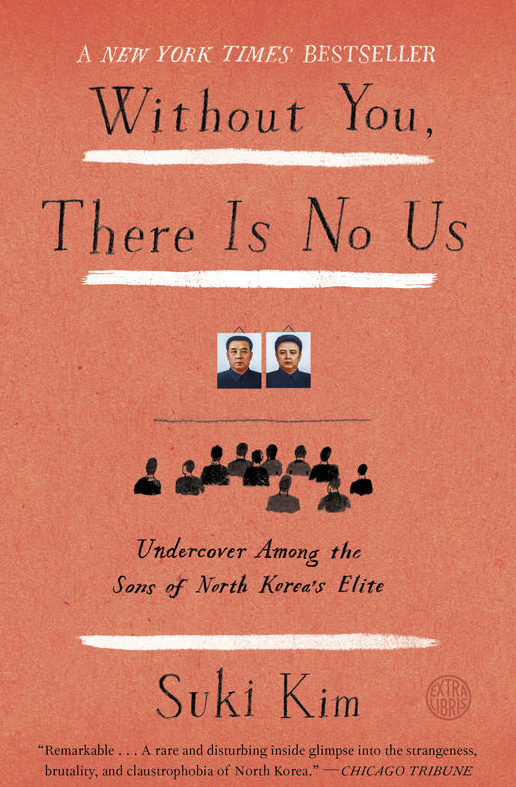 Without You, There Is No Us: Undercover Among the Sons of North Korea’s Elite (p. 257). Crown/Archetype. Kindle Edition. Today North Korea is a vilified nation, a nuclear proliferator, and a world-aggressor. All we know about North Korea, for the most part, is the iconic image of the boy-dictator Kim Jong-un, and the lackeys in uniform who surround him. We think about parades of tanks, masses of soldiers in goose step, and missiles hauled on trucks through wide boulevards lined with trees. We think about nuclear missile tests. We don’t know much about this country that gets so much bad press around the world. Reading Suki Kim’s book Without You, There is No Us opens up a wide window into this elusive and closed society. North Korea is an example of an entire nation of 25 million people completely and totally brainwashed for generations. The country’s elite does not get Internet access or modern computers. They cannot research because most topics are taboo. They have been told, for 75 years, that they are one of the most powerful and prosperous nations on earth. And they have no idea that they are actually one of the most isolated nations, resembling a concentration camp of 25 million occupants, who live under 19th century conditions, with shoddy power, terrible infrastructure, malnutrition even for the elite, complete suppression of the media, no access to modern music, art, literature or cinema. Even family members are kept apart. The boys in the college are not allowed to communicate, even by letter, with their families or friends. When they are in the military, for years at a time, they don’t get to come home – in a country the size of Pennsylvania! North Korea is a threat to world peace, particularly now, where the president of the United States is widely viewed as the most serious threat to world stability. Every American should read Suki Kim’s book to better understand the tragic and failed experiment that is called North Korea. One man, with the aid of his father and grandfather, has managed to subjugate 25 million people, by keeping them underfed, uneducated and in constant fear – just so he can aggrandize himself – and eat well. In the United States we have less than 5% of the world’s population, but almost a third of all mass shootings. Do my gun-supporting readers and friends have any idea why that is? I am honestly curious about their insight. Does the “struggle against foreign enemies” make you think of anything? Are we seeing propaganda campaigns that are creating an atmosphere tolerant of violence against minorities? Let’s make sure we don’t get passive just by getting used to the constant barrage of violence. 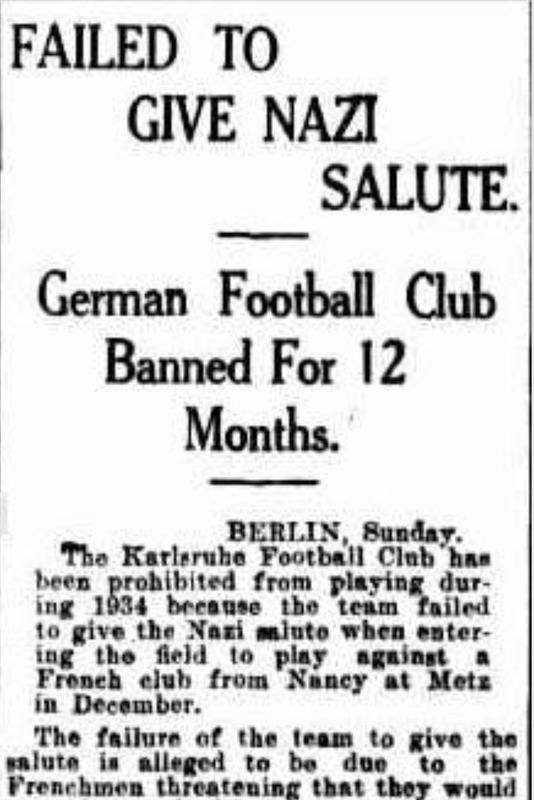 After a few years of it, the German people didn’t mind when anti-Semitic economic legislation followed. By then, it had always been like that, preached from the very top of the government. Erdogan Bodyguards Beating up American Protestors in D.C.
We’re rapidly making America great again. 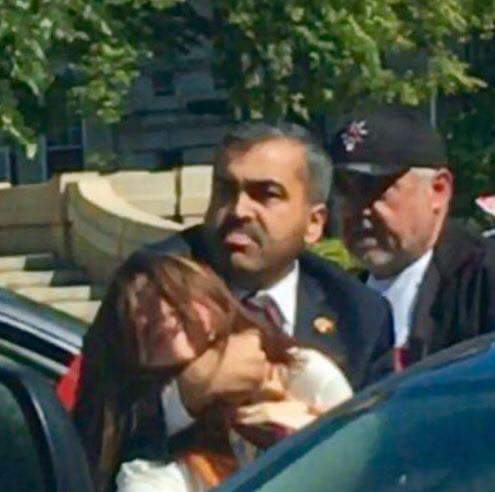 Here is an American Yazidi woman being strangle-held by an Erdogan bodyguard in D.C.
It’s not enough that we support overseas strongmen like Erdogan. We invite them into the Oval Office, and on their way there we allow their bodyguards to attack and beat up protestors. Not just did they strangle this woman, they beat up others and kicked them, repeatedly, and sometimes into their faces, while they were on the ground. D.C. police tried to interfere. And all this while their boss and dictator, Erdogan, was palling in the Oval Office with our President Trump. Erdogan should not be in the White House. The White House should oppose Erdogan and his illegitimate presidency. I, for one, do not like the looks of our new American greatness.